My journey with Holy Yoga (HY) began a few years back in 2014 when I first started dating my husband. While getting to know each other, he found out about my professional dance background and my love for health and fitness. He invited me to join him for a yoga class he’d been attending through our church. Already a keen yogi, I was definitely up of it. Yoga and I – it was love at first sight. I fell in love with this practice. I had never imagined that I would enjoy yoga. And Christ-centred yoga? That was completely new to me. But just like that, the light bulb turned on! 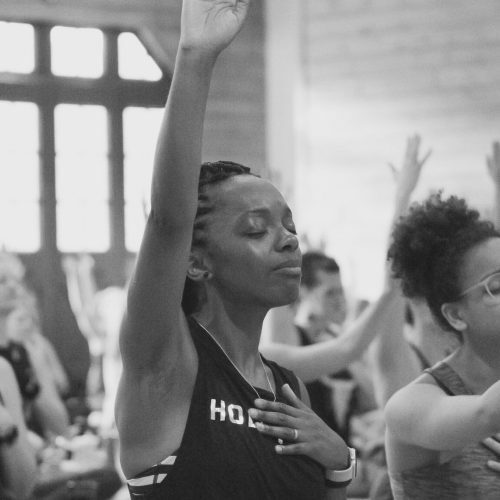 This was so much more than just a yoga class. It was a special time in God’s presence. As prayer and Scripture were spoken over us and as we moved through poses to worship music, I found myself worshipping my Heavenly Father in a whole new way. Mind, body and soul in sync with Him. I was drawn to a regular practice. 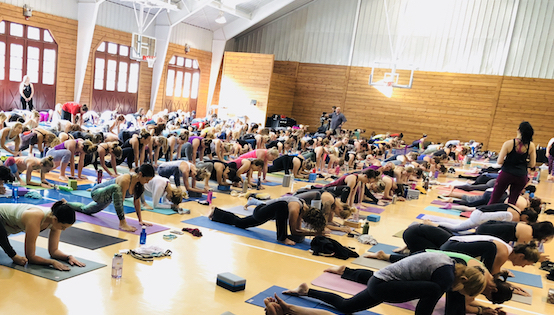 One day, during a class, I felt this nudge….“What would I need to do to become an instructor?” Immediately after class, I spoke to the instructor of the class, Angie. She was thrilled that I was interested and expressed how she had been praying for more Holy Yoga instructors in London. Fast forward to 2017, my husband and I were now married. I had been working in the West End (London) on a musical theatre show and was now on tour in the UK with a play. I still had the burning desire to do the HY Instructor Training but with my work schedule and all, it would need to work out logistically and of course, financially too. During the summer, I began looking into the dates of the upcoming trainings. The course is split into two parts, I just had to fit them both within one year of each other. In order to raise funds for the training, I raised some of my prices for my voice-over work. I received blessings from the donations made by my family and friends. Not long after, I found myself in a position where the possibility of training became a reality. God opened doors and provided for me to sign up. So I did. For eight weeks, I immersed myself into the HY Instructor Training course. Travelling between three different countries and time zones for work, I was lead through Bible studies, spent time journaling, reading, learning the origins of yoga, yoga poses, prayer calls, webinars and yoga practice. I will admit there were times when I thought I wouldn’t be able to keep up with all that was required with the travelling I was doing, but It’s amazing what you can achieve once you commit to something, especially if it’s for God. He simply makes a way. Due to my work schedule, I had to wait six months before I could attend the final retreat requirement in order to complete my training. (During the six-month gap, though, I was able to connect with other HY Instructors in the cities that work took me to – Sydney, Melbourne and Hong Kong! These instructors I would later see at the retreat I was going to.) Faithfully as always, God planned that the spring retreat fell on a free week in my busy schedule. As I stepped off the plane in Phoenix, Arizona in the U.S., I was still pinching myself. I couldn’t believe I actually made it. When I had thought this was not going to be possible, God just continued to open door after door. The week at Young Life Lost Canyon Arizona, wasn’t going to be easy (especially as I was 11 weeks pregnant!). We would wake at 6:30am and start the day with meditation and prayer. I loved this quiet time, either listening to His voice or just enjoying the silence and resting in his presence. We had yoga classes twice a day, along with posture breakdowns and the opportunity to teach our fellow instructors. Each cabin also spent time together with our small group leaders sharing what was on our hearts, having the opportunity to pray for each other and a chance to leave whatever was heavy on our shoulders behind on the mountains. It was beautiful to see transformations as the weights were lifted off each person. My favourite moment of the week was during the last night of the retreat. We were asked to step outside and all the lights of Lost Canyon had been switched off and we were confronted with a star-filled sky. It was so beautiful. A wave of the Holy Spirit’s presence washed over me. Overwhelmed by His presence, I asked God why He brought me there. He answered, “To show you how much I love you. To show you my glory”. I’ll never forget the sight my eyes behold that night, the wonder of His creation. I left the retreat with confidence that I was meant to be there. He had given me this gift and I should use it to glorify Him and help others who want to spend time in prayer and moving meditation. -Caring for body, mind and soul. I no longer need to fear about my ability and have learned to find confidence and strength in Him, the source. At HY Instructor Training, you’ll meet women and men of all different ages, cultures and backgrounds. Each with a different story of how and why they have found themselves at HY retreat. If you’re thinking about becoming an instructor, I say, “do it”. If you’re thinking about going to a Holy Yoga class, I say “go”. He’ll meet you there on your mat. Where to go from here? God will lead, don’t worry. As for me? I’m excited for His plans for me as I join hands together with the team at Grace x Strength to share my gift and my love of Jesus with the world.